We have also been involved with Deerhounds since 1996 after taking over the Weirskints prefix formerly owned by Christine Stead. Christine had produced some wonderful Deerhounds during her 30+ years of involvement with Deerhounds. So when Christine expressed a desire to stop breeding and showing Deerhounds , we decided to continue her good work with her existing dogs. 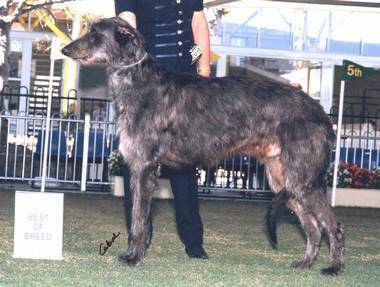 Some of our sweetest dogs have been Deerhounds.